This environmentally-friendly private island getaway offers beautiful white sandy beaches, tropical forests, and excellent diving. Rising dramatically from the depths of the Koro Sea and on the fringe of Bligh Waters, lies the mile-long 110 acre island of Namenalala (shaped like a dragon), surrounded by one of Fiji’s most pristine diving and snorkeling reef ecosystems known as the Namena Barrier Reef. This secluded island escape offers only 6 traditional Fijian bures which are spaced hundreds of yards apart to provide the ultimate in privacy. Bures are hexagonal in design and feature a King-size canopy bed with mosquito netting, coffee/tea making facilities, romantic gas lamps, solar lamps, and ceiling fan. All meals are included in the rate. Bougainvillea, Hibiscus, and Mango Bure – Located along the north ridge. Nautilus Bure - Located at the cliff top on the south side of the ridge. Vandra Bure - Located on the beach. 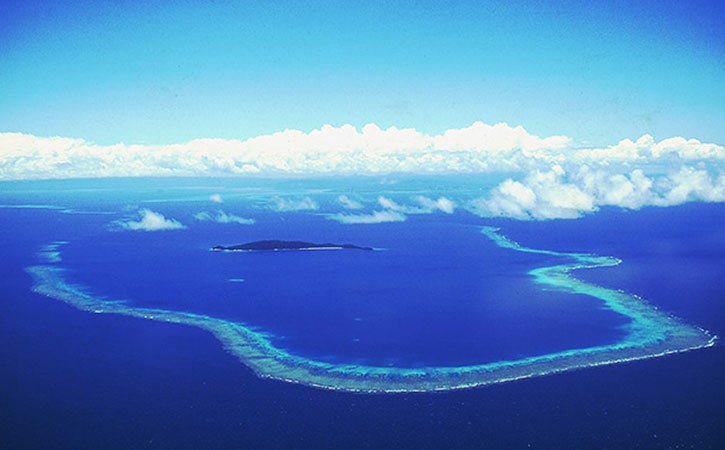 The Namena Barrier Reef is one of the South Pacific's most diversified reef ecosystems. The reef and waters within have been a Marine Reserve since 2004 (more later on the Namena Marine Reserve) so the diversity of corals, both hard and soft, along with prolific marine life have blossomed since the 'no fishing' ban. As you can see by the aerial of the Namena Barrier Reef and Namenalala Island within these waters, the area is once again breeding grounds for every type of marine animal. Although Fiji was hit by coral bleaching in 2000 and again in 2002, the recovery of the corals is spectacular. Divers who have visited the Great Barrier Reef off Australia comment time and again that their diving experiences here at Namena are superior to those they have had on that Great Barrier Reef. The Fiji Islands are known as the Soft Coral Capital of the Pacific. It has it all ... sheer drop-offs, graduating walls, bommies (sea mounts), current, no current. There are several openings in the barrier reef and in those openings the current will be stronger than experienced along the wall where divers can drift along in little or no current. We work with the tidal changes, choosing the North Wall sites for the incoming (rising) tide; the South Wall sites for the outgoing (falling) tide. Soft corals bloom in current so sites like the Tetons, Chimneys, Neptune's Haunt and other bommies on the south side along with the South Save-a-Tack Passage and Unmarked Passage are subject to current. They don't have ripping current like experienced in the Somosomo Straits during certain moon phases, but the current can be a little stronger than normally experienced during those moon phases. At the North Save-a-Tack Passage, at one side is Grand Canyon, a sheer drop-off which is charted around a mile deep! On the other side of the entrance are The Fish Patch, Window of Dreams, Kansas and other exciting dive sites. Often, they drop divers at the tiny bay and let them slowly drift along the wall to the entrance to the North Save-a-Tack Passage where they finish their dive. Some of the favorite dive sites are bommies on the south ... Chimneys and Tetons, Neptune's Haunt, Black Forest, Seven Dwarfs ... these bommies are covered with a wide variety of soft and hard corals and loaded with a variety of fish, nudibranchs and other sea creatures. On the south wall beginning at the South Save-a-Tack passage, they have beautiful sites like Pirates Den, Rainbow Wall, Manta Mount, Cascades, Magic Mount, The Fingertip to name a few. Moody’s does two dives daily. The morning excursion leaves the docks at 9:00 a.m. After a leisurely dive, we return to the island where some folks head for a hammock, do some snorkeling along the shore or just lay on the beach. They have lunch at noon and the afternoon excursion leaves the docks between 1:30 - 2:00 p.m., depending upon the site your divemasters have chosen. Most sites are around 10-25 minutes from the island; they use two boats, depending upon number of divers and prevailing sea conditions. TOFUA is a 33 foot cabin cruiser with covered roof; SALTSHAKER is a 28 foot fiberglass with a 225 hp outboard engine. Water temperature ranges from 76-78 F. in July & August (Fiji's winter); average remainder of the year is around 80F. 3mm wetsuits (long sleeve/long leg) for winter months is recommended. Ask us about our current specials at Moody’s Namena!